I'm a total cartographile, so when I found out about Green Map, my map-lovin' heart skipped a beat. 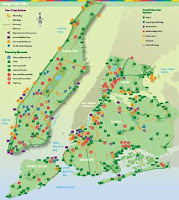 Green Map is exactly what it sounds like, a global source for geographically charted information on all things green. You can explore maps around the world or become a mapmaker by starting a project in your area (that is, if it hasn't already been created). For example, in my neighborhood, one group, Recycle-a-bicycle, charted a map that takes bikers to potentially endangered community gardens in order to educate the public about them. They're also in the beta phase of a new open map that anyone who signs up as a mapmaker can contribute to. You can help support this educational effort by donating via GlobalGiving. More about Green Map at Grist and Treehugger.